Computer models are providing valuable insight to the structure and function of both Ebola and Zika viruses as they invade the host’s cells. Side view, left, and top view of the Ebola Virus fusion end-state in a molecular dynamics computer model. LOS ALAMOS, N.M., May 14, 2018—The viruses that cause Ebola and Zika, daunting diseases that inspire concern at every outbreak, share a strong similarity in how they first infiltrate a host’s cells. Through the computer modeling capabilities of Los Alamos National Laboratory, the molecular calisthenics involved in invading a cell are visually documented, an essential step toward vaccine and therapeutic medicine development. “The two very different viruses both use a surface protein to initiate a process called ‘membrane fusion,’ which allows the viral entry into the host cell,” said Chang-Shung Tung, the leading and corresponding author of the recent work in the journal Biomolecules. “Before the membrane fusion started, these two proteins went through large conformational changes that was not fully understood, as the proteins would take on the physical shape that would allow them to fuse with the cell and begin the infection. 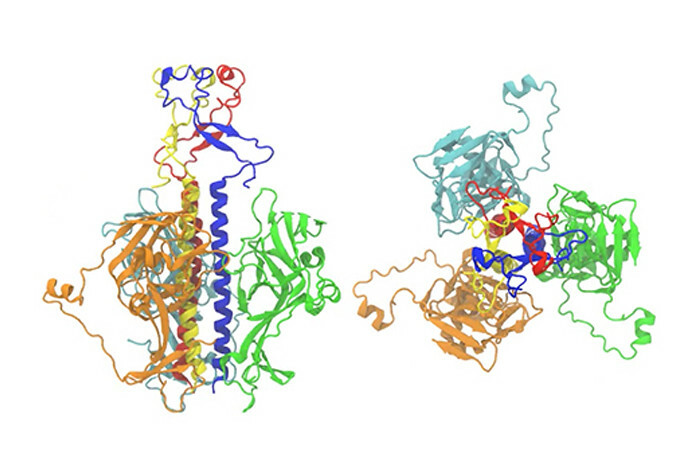 In this work, we modeled the structures of the two proteins in the fusion-initiation state. Then we used the structures to explain how four different antibodies in our bodies can fight the infection and block the viral entry, based on how they bind to these two proteins,” Tung said. The aim of the team’s work was to understand the specific structure-function relationship of the Ebola glycoprotein (EBOV GP) and Zika envelope (ZIKA E) proteins, the ones that are instrumental in the fusion with the host cell. Combining the available structural information from both low- and high-resolution experimental protein structures, the team used a computational approach developed at Los Alamos by Tung, the Motif-Matching Fragment Assembly (MMFA) method. Having modeled both the invasive protein structures and the antibodies fighting off the infection, the team was able to see that the antibodies take a multilevel approach to the battle they wage. Some antibodies prevent cell entry by blocking the “pre-fusion to fusion” transition, while others prevent the exposure of the fusion peptide at the tip of the molecule when the envelope proteins are in the fusion state. Some antibodies take a further step and make use of both mechanisms by blocking both the transition AND the exposure of the fusion peptide when the envelope protein is in the fusion state. Overall, Lappala said the work provides a visual interpretation of how two distinct proteins in very different structural arrangements convert from pre-fusion to fusion states. She is confident that the modeling approach will be useful in the prediction and assessment of antibody binding to the viral proteins – an area of vast interest for its medical applications. Publication: Structural Transition and Antibody Binding of EBOV GP and ZIKV E Proteins from Pre-Fusion to Fusion-Initiation State, in Biomolecules. The authors are Anna Lappala, Wataru Nishima, Jacob Miner, Paul Fenimore, Will Fischer, Peter Hraber, Benjamin McMahon and Chang-Shung Tung of Los Alamos National Laboratory, as well as Ming Zhang of the University of Georgia. Nishima is also a member of the New Mexico Consortium. Funding: Los Alamos National Laboratory Research and Development program supported this work.